Although there are countless works in different genres about Anna, a queen of France, the daughter of Kyivan Prince Yaroslav the Wise, this is the first time her life story is presented in the format of comics. This genre is not so far very popular in Ukraine, but initiators of the exhibit “Drawn Strip,” staged at the National Sanctuary “Sophia of Kyiv,” are convinced that this way of showing history is above all intended for young spectators for whom the form is the main criterion of perception. The creators describe their idea as a “mixture of history and myth” focused on the creative process rather than on documentation of facts. The project, consisting of 14 narrative pictures about various milestones in the life of Anna from childhood to her last days, was carried out by 14 masters from Kyiv, Poltava, and Volyn. It took about six months to do this. The work comprised drawing the pictures, writing the text, stylizing and applying it to the canvases. Svitlana Mikhno dealt with the text design, and the well-known Ukrainian authoress Dzvinka Matiiash was responsible for writing the text. She calls the project “an attempt to animate Anna Yaroslavna,” although she says it was not so easy because of considerable distance in time. “It is important that we still remember the people who lived a thousand years ago. This project is sort of a bridge between what was in the past and what is now. We are trying to catch all details in order to show: we resemble each other very much – similar things did and still do unite us. We are equally afraid of illnesses and failures and are looking for someone to rely on,” the writer muses. The idea of creating the project belongs to the Kyiv-based artist and architect Ksenia Lareli. 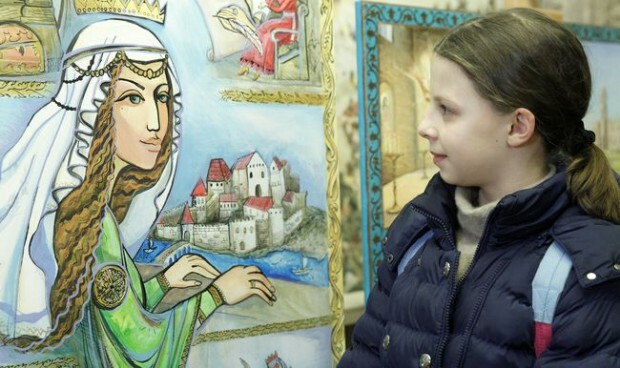 There are two of her pictures at the exhibit: Ancient Kyiv (on Anna’s childhood against the backdrop of the capital’s everyday life) and Dynastic Fuss (on the marriage proposal, in which connection Fench envoys arrive at the princely court). Some symbolic details play an important role on this works. For example, the artist says she depicted little Anna in the image of Orans the custodian on the first canvas. The second one shows the moment the heroine is leaving Kyiv and writes her name on St. Sophia’s wall – this autograph of hers can be seen even today. Tellingly, each of the artists chose the subjects close to them and tried to depict the chosen fragments as originally as possible, showing a non-trivial view on Anna’s life. “We were given freedom in this project – without any conceptual limitations. We were only asked: please do not watch films, do not take other pictures into account – you must see the heroine with your own eyes and look closely into her life,” says Olha Mashevska, the author of the picture Royal Family. Incidentally, this canvas shows a somewhat unusual interpretation of the image of Anna – not as a queen and a wise ruler, who made a considerable contribution to the development of the French state, but as a woman and a loving mother of four children. “I tried to show that even this extraordinary woman had an ordinary feminine life,” the authoress explains. She adds that this subject is particularly close and understandable to her, for she also has children and, besides, runs a children’s artistic studio. The masters willingly share their impressions of working on the project, trying to persuade me that they worked easily and with pleasure. For example, Olha Halchynska, the author of the pictures Church Wedding and Coronation, is convinced that “the subject found her by itself.” Olha’s canvas shows the moment Anna takes her oath on Reims Gospel, the book from her father’s library she brought from Ancient Rus.’ “The point is that when I studied at the art academy, my graduation project was ‘The Library of Yaroslav the Wise.’ It is my subject indeed!” the artist says. Another young participant, Anastasia Taranenko, drew the picture Countess de Crepy about a little-known episode in the life of Anna – her second marriage after the death of her husband with Count Raoul de Crepy. She says she was not afraid that she herself had too little experience to feel this subject. But she is sure that true love is always nice. The presentation of the exhibit in Anna Yaroslavna’s tower of St. Sophia’s, with the participation of young domra-players from a Kyiv music school, which was, incidentally, timed to St. Valentine’s Day, seems to be a good and justifiable attempt to restore the link of times for at least a short while. The project initiators are convinced that it has a future. They particularly hope that Ukrainian children’s book publishers will take interest in it, and it will be possible to extend the project to the format of a children’s graphic novel.